I have already discussed what happened between these two in the anime. Oh, yes I have. In both my Nephrite and my Nephrite/Naru shrine I have told this story. So we've already gotten that much straight, right? Zoisite and Nephrite were not friends; Nephrite wanted to take Zoisite's job, Zoisite kidnapped a girl Nephrite was fond of and eventually had him killed. The end. That is not the point of this section. This section is to analyze the nature of the rivalry between these two characters, because so often it's... confusing. Rather than discussing the end, what with Naru-chan and everything, we're going to trace what exactly happened here to try and clear up as much as possible. A common misconception I've seen online is that Zoisite hates Nephrite because Nephrite takes over his job of seeking the ginzuishou. While that does act as a catalyst, their relationship is in no way that simple. Zoisite was definitely against Nephrite from the beginning. Now, I've seen a number of explanations for this, ranging from Nephrite having done something horrible in the past to Zoisite, to Zoisite looking to ensure that Nephrite does not succeed and thus take Kunzite's position of first king, to some sort of sexual tension and/or past between the two. I can't say any of these is something that is impossible (though I really can't see either of them hiding any secret affection for the other...) ; nor can I put down any other suggestions. And neither can I make any suggestions of my own and offer them as truth. It's just not part of the show, and is one of those gray areas left up to fanfiction. Now, regardless the background (because, like so many things in this group of villains, speculation is interesting but of no definitive value), there is something weird going on between these two. It's common in the Sailormoon anime to have rivalries between villains -- after all, Nephrite is the first of several to lose his life to a comrade. However, the weird thing is the form their animosity takes. Perhaps it's that Nephrite doesn't take Zoisite seriously, but this rivalry goes on for far longer than it should. Zoisite appears in Nephrite's first appearance as head king, and snidely taunts him, telling him that his overconfidence would be his downfall; Nephrite just tosses him this disdainful look and tells him to leave. And why does Nephrite put up with Zoisite's clear animosity? The thing Zoisite does that is quite interesting is that he seems to be playing some head game with Nephrite. He frequently asks Nephrite if he's confident, if he's afraid, if how bad he's doing bothers him. And yet Nephrite doesn't say anything much. Yet. Perhaps this demonstrates a fundamental difference between the personalities of these two. Maybe Nephrite had been forming a plan to seek the ginzuishou all along, and used Zoisite's foolish taunting to his advantage. Or maybe he just is more meticulous about his thought, ignoring Zoisite as a useless threat but keeping a backup plan in his head all the while. At one point, Nephrite does say something to Zoisite. He asks him what happened to his (Zoisite's) mission; what happened to seeking the ginzuishou? Nephrite then tells Zoisite to stay out of his business until his own work has succeeded. This little thought (which, incidentally, takes place in episode 17) leads into another crucial scene. Episode eighteen is where things get a little weird. Zoisite outright asks Beryl to be partnered with Nephrite. Beryl, weirdly enough, sees the benefit of teamwork and agrees. 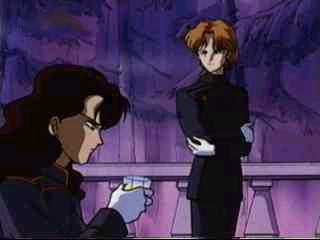 But Nephrite, who does not want to be paired with anyone, least of all Zoisite, refuses. Then the clincher. Zoisite innocently comments something about refusing the queen's command, and Nephrite outright declares that he is not doing this for Beryl; he is doing this for himself. Beryl does not appreciate this. Zoisite does, and thinks to himself that his plan is going along wonderfully, because Nephrite has fallen out of Beryl's favor. And then it continues. 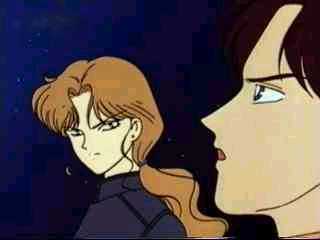 Zoisite, strangely enough, enters the next episode by telling Nephrite that Beryl wants to see him. Then, rather than leaving once his messenger job is complete, Zoisite hangs around and makes sarcastic comments. 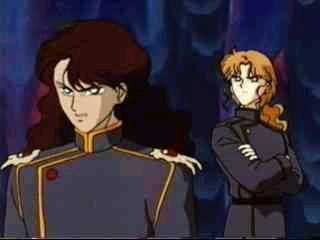 Rather than saying anything about Zoisite, though, Nephrite merely insists that he will be victorious. Indeed, at the episode's finish when Zoisite suggests that Nephrite gets put in Eternal Sleep for failure, Beryl does not concur -- Nephrite had not killed Sailormoon, but he had gathered great energy, and that makes up for it. (Too bad she wasn't this sympathetic toward Jadeite!) 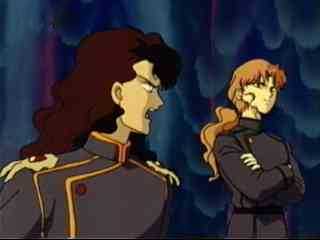 Instead, Beryl gets angry at Zoisite for not doing his job and acting as a tattletale toward Nephrite. Nephrite just smirks. Clearly, this has been his intention all along. Then, things get weird again and take another turn. Zoisite appears on Nephrite's balcony, in the screenshot seen earlier. And while Zoisite is as mocking as ever and Nephrite greets him with "You again", using the (as I understand it) quite rude form of "you" (kisama), it does not appear that they are outwardly against each other as the past few episodes had been showing. In fact, Nephrite even lets Zoisite into his stargazing room, where they watch his "strongest youma" together. And the taller king brags about these warriors, and the shorter acts genuinely interested. What the heck? 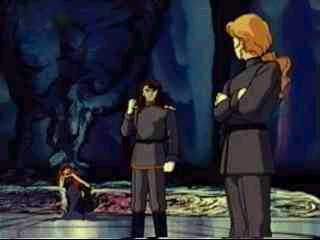 But Youma Castor and Youma Pollux are defeated, to Nephrite's shock, and Zoisite takes the opportunity to laugh at Nephrite's expense once more. So much for a truce. And that's when he goes running to Kunzite-sama and starts sobbing into his knee. Kunzite is now another minor player in this interesting little struggle, and his response to Zoisite's concerns is, in effect, to watch Nephrite to see what he's got. 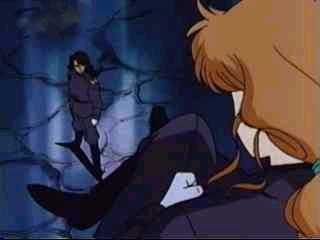 At this point, Nephrite, who isn't nearly as stupid as some people tend to think, realizes that he's in trouble. Beryl is getting mad at his failures and belligerence. Zoisite, realizing this, attempts to taunt him again. But Nephrite now has ammunition. He mentions the ginzuishou again, and that instantly sets Zoisite to shaking and nearly to tears. He flees to Kunzite again, who offers the consoling advice that if -- if -- Nephrite obtains the ginzuishou, they could easily take it from him. Nephrite, in the meantime, is a bit upset at himself for letting someone as petty and insignificant as Zoisite, whom he sees as a mere annoyance, get to him. All right. We all know what happens from here, right? The 'let's-kidnap-Naru" plan is old news, as is Nephrite's so-called 'conversion' to the side of good and his subsequent death at Zoisite's command. So let's stop and think about everything for a moment. Zoisite is one of those types who can taunt but can't stand being on the other end of that. And Nephrite is overconfident and superior to the point that he brings about his own downfall. That is the most obvious development that this pair gains from this interaction. Neither of these is a positive thing, but it helps to round them out as characters. They have their bad traits, but they're not just nasty. There are other elements, too. If you watch the body language of this pair of gentlemen, it's often quite repetitive. For example, Zoisite almost always has his arms crossed. Look at the screenshots here; I'm not lying! While admittedly Zoi's one of those people who apparently likes to keep his arms folded, it sends definite mixed messages. Generally, Zoisite's facial expression and stance (especially the tilt of the head) in these scenes give off either an air of feigned innocence or an air of thinly-disguised scorn, but the arms tell a different story. It almost looks like, though he's trying to make the folded arms give him a confident image, he's really not confident at all. Crossed arms often are a symbol of insecurity, of protecting oneself. And maybe that's what Zoisite is doing, attacking to protect himself, to hide his insecurities. But sometimes he gives himself away. Nephrite, on the other hand, generally stays very loose when Zoisite's around. His arms are at his side, and the only way you can tell he's annoyed is by the clenching of his fists and the set of his shoulders. And mostly Nephrite's face is rather impassive... unless pushed too far. 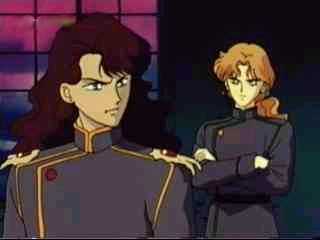 And it is when Nephrite is at his angriest that Zoisite is his most smug. It's only when Nephrite becomes overly casual in his threats -- thus giving the impression that he is not making threats but making vows -- that Zoisite worries. And when Zoisite's worried, it's quite clear -- he either makes an annoyed face or begins to tremble out of rage. Nephrite, quite frankly, does not worry much, not even up in the end. And as such he doesn't show much on his face, either. Even when saving Naru-chan from Zoisite's henchyouma, he remains with this disdainful look, rather than being truly upset. Anyhow, the way they interact remains the same up until the very end. Zoisite, victorious, is gloating -- and his arms, when he appears, are not crossed. (though he will continue the crossed-arms position in later episodes; this instance is a one-of-a-kind symbolic thing) He is no longer threatened in the least by his once-superior king, because Nephrite has failed. He is no longer quietly intimidating and haughty; he has been grounded to earth by both the thorn sticking through his shoulder and by the young girl he is vying to protect. And so that's the end of this tragic little relationship, which is definitely the most-developed rivalry between any two villains in the series. We don't know why it began, we don't really know what they were thinking, but we know how it ended, and trying to work backwards from there is quite an exercise. But it's not so simple as a fight over a silver crystal, now is it? Some people just do not get along.